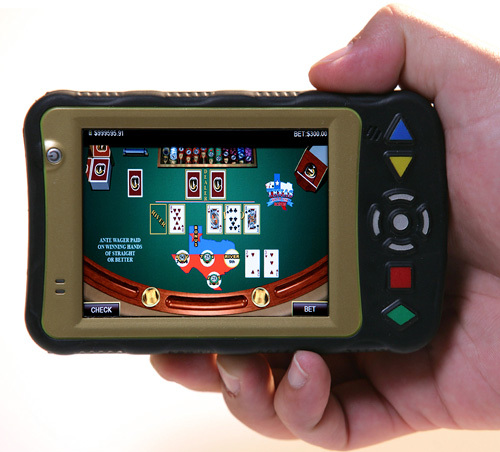 Cantor Gaming eDeck For Gambling On-The-Go | OhGizmo! In Las Vegas the casinos do everything they can to keep you on the gaming floor so that you’re spending as much time as possible emptying your pockets during your stay. But a company called Cantor Gaming has realized there are still a lot of missed opportunities where a casino guest might be away from the poker tables and slot machines. (Eating at a restaurant, lounging by the pool etc.) So the company spent 5 years developing the eDeck which is a wifi equipped portable gaming device that allows casino patrons to gamble and play for real money wherever they happen to be. Once you’ve setup an account, and have logged in on the device, you’ll be able to play casino favorites like blackjack, baccarat, slots, video poker and roulette. In the future the company hopes to offer new games including live-action poker, sports betting and even proprietary games. (Imagine Tetris played head-to-head for real money.) The eDeck is currently being tested by the Venetian, but at the moment the wireless network restricts the device to only working in the high-stakes slots lounge. But eventually, if the preliminary tests go well, you’ll be able to use the device everywhere in the hotel, even in your own room. This is one handy gambling gadget. Aside from a laptop with an internet connection.